What can art teach us about the effects of violence against women and girls? 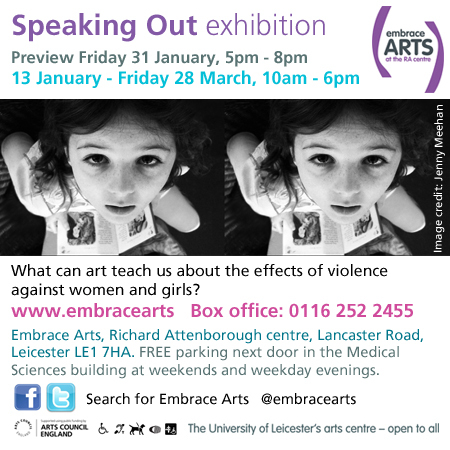 On 31 January 2014, Embrace Arts, the University of Leicester’s Arts Centre, will bring together artists, survivors, support organisations, and local communities to creatively explore the causes and effects and find empowering responses to gender violence. The event, Speaking Out, will address the difficult issue of gender violence, moving the debate forward and offering a positive contribution to social policy. With a focus on the survivor’s perspective as the creative subject without victimising, blaming or seeking to hit back, Speaking Out will enable a significant shift from ‘victims’ as the object of voyeuristic discourse to survivors as the arbiters of their own selves. “There is an urgent need for a wider debate about the magnitude of gender violence’s effects on survivors and society at large. News coverage of domestic violence generally focuses on high profile, extreme cases, but this reduces awareness of ‘everyday’ forms of domestic violence and other behaviours affecting people. In particular, the scale of the problem for disabled victims is rarely debated. This one-day symposium is open to all. Speakers include Judge Sureta Chana, Victims Representative, Kenya Case 1 at International Criminal Court and expert for the Preventing Sexual Violence Initiative, and artist Villayat ‘SnowMoon Wolf’ Sunkmanitu, who raises awareness around PTSD. Speaking out takes place on Friday 31 January 2014, 10am – 5pm at Embrace Arts, Richard Attenborough Centre, Lancaster Road, Leicester LE1 7HA. The event will be followed by a performance SSoCiaL and drinks reception. The Speaking Out exhibition and symposium was covered widely in the media, below shows a selection of publications and online listings. The ‘Speaking Out’ project at Embrace Arts, the University of Leicester’s arts centre, brings together artists, survivors, support organisations, and local communities to creatively explore transcending gender violence.